One morning in May 2017, Abdul Fahim left home for a routine fishing expedition in Wasini Island, something he had done every day for most of his life. As an experienced fisherman, he knew his way around the ocean, and was looking forward to returning home with a great catch. Unfortunately, Abdul never made it back. According to eye witnesses, his boat developed mechanical issues while deep at sea, and rescuers who tried to reach him had to abort their mission after several failed attempts to communicate with Abdul. It’s a story that the people of the island, located in Mkwiro Village in Kwale County, are all too familiar with; a story that is etched on the faces of family members as they recall the painful moments preceding confirmation of the loss of loved ones at sea. Wasini Island is an idyllic paradise. Famous for its dolphin tours, scuba diving and snorkeling, seafood, and sunset dhow cruises, the island covers a span of seven kilometres long and three kilometres wide, and is a tourist’s dream. Like many coastal villages, the residents of Wasini live a simple life. So simple in fact that there is no electricity, pumped water, and no police station in sight. And none is needed, since the area is considered one of the safest in the country. All 3,700 residents know each other well. There hasn’t been a single report of insecurity in the area in recent memory thanks to a strong community policing culture that has helped keep criminals at bay. However the lack of telecommunications infrastructure has for many years hampered not just development; it made it nearly impossible to save the lives of fishermen who found themselves in trouble while out at sea. Not only that, anybody wishing to communicate via mobile phone had to, until four years ago, walk long distances to access basic services such as voice and M-PESA. But today the residents tell a different story, one of finally feeling connected to the rest of the world. Erected by Safaricom about four years ago, the telecommunications mast has supported development in the area, with residents now enjoying a reliable 3G network and a piece of the M-PESA pie. But the most valuable thing the mast has done, is allowed the residents to communicate with ease, whether to share important community news, report lost and found items, or to discuss more serious issues through community barazas. “The residents of this area have benefitted greatly from the installation of this mast. Before that, we didn’t have access to a reliable network, but now we can make phone calls with ease. Secondly, we didn’t have M-PESA services here, we had to cross to Shimoni mainland, but now we can send and receive money wherever we are on the island. Thirdly, security has improved greatly thanks to this mast,” says Bey Hemed, Assistant Chief – Mkwiro Village. Hemed is not referring to petty crimes: he’s talking about the security of the island’s breadwinners – the fishermen. In Mkwiro, there are two main sources of income: the women are often artists who make beautiful ornaments, including door mats and curtains, from flip-flop cutouts (known locally as patipati), while approximately 90 per cent of the men are either fishermen or boat operators. This means long hours spent out in the sea. According to the women, most of their husbands and sons are gone for so long they have to be called, just to confirm their safety. Prior to the mast installation, it was nearly impossible to confirm the fishermen’s safety, and co-ordination of rescue efforts was often hampered by a combination of factors, including the inability to communicate with ease. Often times, family members of those missing were forced to either cross over to Shimoni to get word out, or go door to door calling for help. To highlight the impact of the mast on the daily lives of Mkwiro residents, Ropa Mohammed of the Beach Management Unit (BMU) dashes off midway through our tour of the island, after receiving a call about two fishermen who have been missing since the previous night. 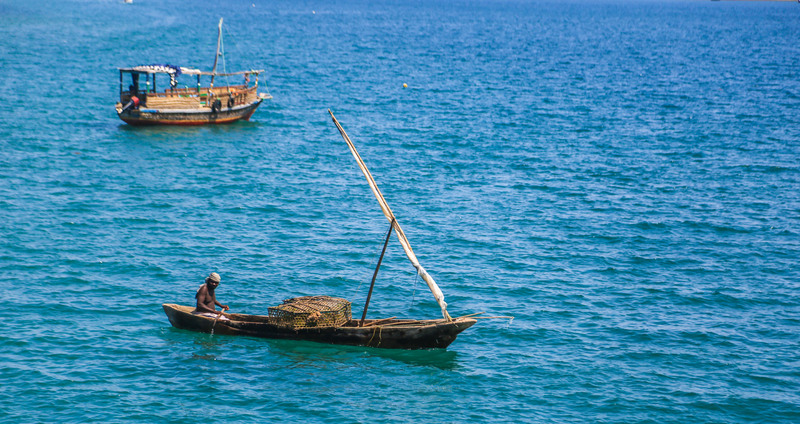 It’s a call that creates panic among the members of Wavuvi Association of Kenya, a fishermen’s support and advocacy group with 100 sites along Kenya’s coast, and a membership of more than 30,000. The members however reckon that improved network has contributed significantly to their welfare, and enhanced communication between the fishermen and the Beach Management Unit. The ability to make a phone call might not seem like a big deal, but to this community of hardworking fishermen and their families, it makes the difference between being lost at sea, and coming back home to their families every day. Now all they need, they say, is to get fresh water pumped into their homes, and to get connected to the national electricity grid so that they can set up more businesses – charge their phones without having to cross over to Wasini.